Nightingale Sentinels are the guardians of Nocturnal. They can be found standing guard in the Twilight Sepulcher. They are equipped with a full set of Nightingale weapons and armor, a copy of Karliah's bow, and elven arrows. However, only the arrows are present when pickpocketing or looting a sentinel. 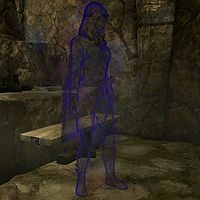 Nightingale Sentinels are not considered undead in the game data, so they are not detectable with the Detect Dead spell, but rather with Detect Life. This page was last modified on 26 March 2014, at 23:43.